“Commodities Real Estate” – That’s Where The Value Is! Residential real estate, commercial real estate – no obvious bargains there. Prices have been booming for years now. In many cities housing prices are actually well above where they were before the bust. You want to know where you can find tremendous value in the property market? 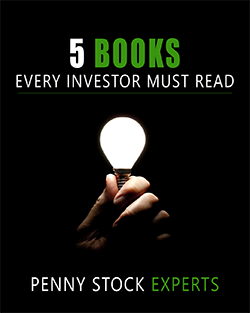 Commodities real estate – Gold, Copper, Cobalt, Nickel, Oil – you name it. That’s where the deals are! Where else can you buy property for half, or even 80% less than the money that’s already been put into the ground? 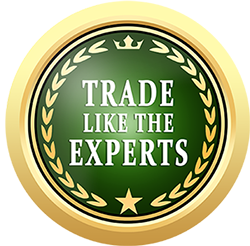 Take Aurcana (AUN, TSX-V), as an example. Market cap $19 million vs. $120 million invested into property, plant, and equipment (an 83% discount?). Call me simplistic, but that just feels like a good deal to me (and I’m normally a go with the gut kind of guy). I just can’t see AUN spending much time below 20 cents. It’s 23 cents now and definitely has multi-bagger potential. 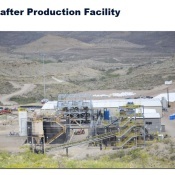 Nearly 18,000,000 ounces of Silver in the ground that’s weighing in at +8 ounces a ton! 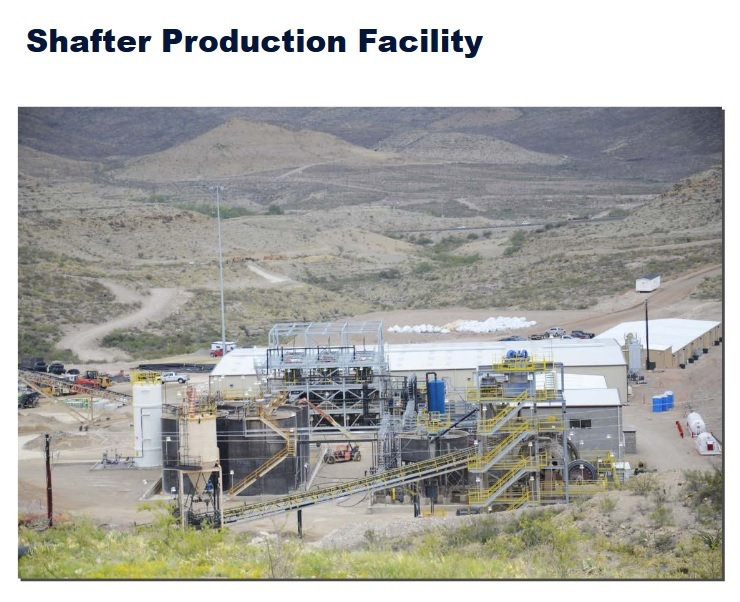 Given the existing infrastructure, including a mill capable of processing 1,500 tpd, Aurcana’s ounces in-the-ground should be valued higher than $1 (not to mention the desirable location, Texas). 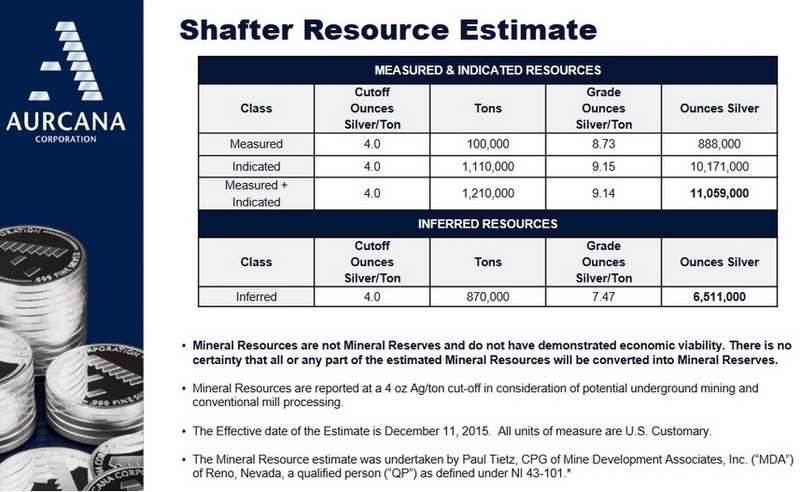 If you wanted to reduce the cut-off grade we could be talking 40 million ounces in-the-ground (or 50 cents each). This Shafter Property has a lot of exploration upside, too! No doubt about it. The thing is wide open at depth, and we know they’ve cut into some pretty good Gold-Silver (plus Zinc and Lead credits) 1.4 miles west of the existing resource. Real wild card here, get a load of this! A few years ago Aurcana entered into a term agreement with one of the Permian Basin’s established Oil operators. They optioned 3 contiguous leases and received a cash payment of $374,469. Plus Aurcana would earn 25% of the net revenues if and when that company gets lucky. The Oil company is moving toward drilling a well, from what I’ve been told. Plus, Aurcana is sitting on another 28 verified Oil and Gas leases (they received more than $100k a piece for the others). …Oil and Gas leases are icing on the cake (any value/upside there certainly isn’t reflected in the stock price). 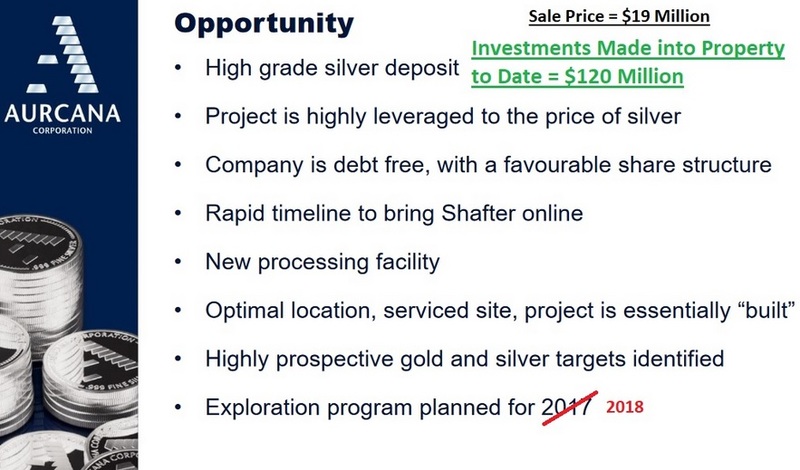 AUN sounds like a great deal to me – solid high-grade Silver property with existing infrastructure selling 83% below what’s already been spent on it. I’m just not seeing opportunities like that in residential or commercial real estate. Commodities real estate is the place to be! And Aurcana provides evidence of that.